SQL Server instances are generally poorly-documented. How easily can you tell if something has changed? How easily can you check that there is adequate space for growth? Are you up-to-date with licenses? What errors are happening? Who has accessing the system? Before PowerShell, it was difficult to be on top of all this. Now you can, with the help of Sander's database documenter. A few years ago, I was tasked with fixing a broken an image conversion process for a hospital. As patient files were scanned in, as BMP files, the process converted them to JPEG and resized them. It could manage only about 200 images a minute, far slower than the image scanning rate, and the process crashed several times a day. Armed only with PowerShell and a few external libraries, plus a reasonable knowledge of .NET, I was able to create, quickly, a new image conversion process that processed over 2000 images a minute and never crashed. Suddenly it was the image scanning process that couldn’t keep up! At the time, PowerShell wasn’t that popular, but this first project was a real eye-opener for me. I was immediately a PowerShell enthusiast and, from that point on, have been using it to automate as many of my routine SQL Server tasks as possible. 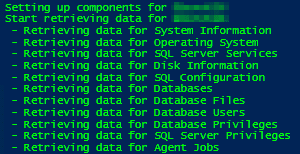 One near constant with any SQL Servers that fall under my care is that they are almost entirely undocumented, or the documentation was created once, a few years ago, and never kept up to date. No more excuses! This is a task crying out for automation, and in this article I’m going to show you how to automate the documentation of all your SQL Server instances using PowerShell and SQL Server Management Objects (SMO), and export the information for each SQL Server instance to a nicely formatted Excel spreadsheet. If someone changes some setting or configuration on one of your servers, how quickly will you know about it? Do you have a list of databases with all their properties? When do the SQL Server agent jobs run? How would you find out the Edition of each of your SQL Server instances, and the hardware on which it is running? 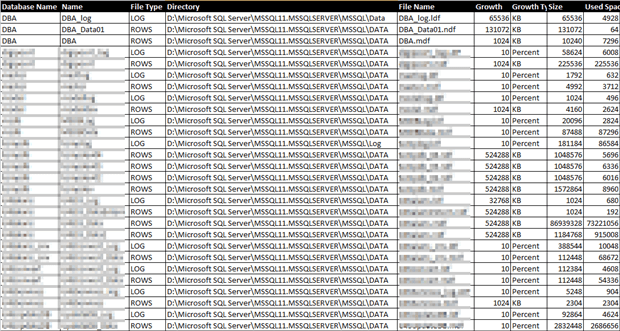 Do you know all the SQL Server logins and users with all their permissions? If asked to setup a new server, in an identical configuration to an existing server, how quickly could you do it? 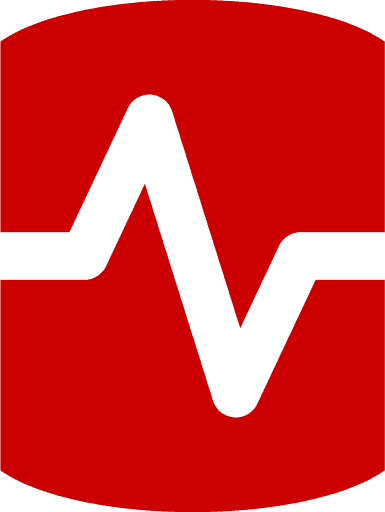 Create baselines – gather performance information from your instance. A baseline can also be an initial configuration of your SQL Server instance installation. Database settings – creating an overview of all the databases with their properties makes it possible to see if the database has grown. Another reason would be to see if there are settings in the databases which are non-standard. For instance, which database run in SIMPLE recovery mode, which databases have a page verification option set to NONE or TORN_PAGE_DETECTION. License audits – Documenting your SQL Server editions and hardware will ensure that your organization is always license compliant. Security audits – If you work in a bank or other financial institution you are probably familiar with security audits. Can you show the auditor a list of all the people who have access to the database? Has there been any change in the last 6 months? How do you prove you are in control? Troubleshooting -the first question you ask in response to a performance issue is often “what changed?” It’s much harder to troubleshoot a performance issue without any server documentation. Memory – Total memory, available memory. File configuration – Location of files. Different drives for data and log? Growth configuration – Growth settings for data and log files. Collation – Collation of the database. Is it different from the default server collation? Users – Created users and their database roles. Jobs – The job and job steps. Schedules – Schedules for jobs, next run date and time. Of course, you might need more information depending on your own environment like clustering, replication or mirroring. 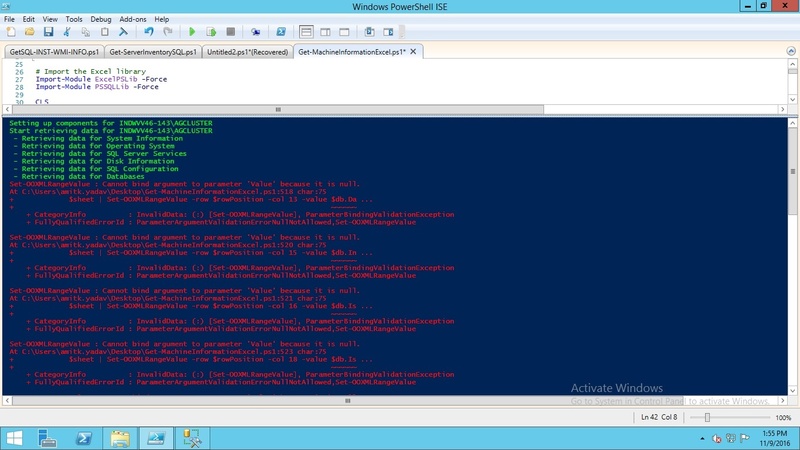 PowerShell can retrieve all of this information and a lot more, using just a few commands. The two main components of this solution are PSSQLLIB, a custom PowerShell module that I built to gather the required SQL Server metrics, and ExcelPSLib, a PowerShell module avaible on CodePlex, for exporting our data to Excel. Let’s take a brief look at each, in turn. Before you can use SMO you have to load it into your environment so PSSQLLIB contains a function called “Load-Assembly” that if supplied the assembly name will load SMO, and any other kind of assembly, assuming it’s not already loaded. The script will check if an assembly is already loaded. Most of the functions in PSSQLLIB use properties of the SMO server object. A few of the functions use T-SQL queries to retrieve the data. Listing 2 shows the Get-SQLServerPrivileges function, to return the privileges for logins. and check whether they are member of a server role. $serverRoles = ($login.ListMembers()) -join ","
To get the SQL Server logins, and associated server roles, we call the Logins property from the server object and save the values to the $logins variable, and then iterate through these login values (excluding system accounts, which start with “##”). If the login is a member of Windows group we create a comma separated list of all the server roles of which that group is a member. Finally, we clear the array of the server roles to be sure the data is correct, and then return the result. You see all the different functions available that we can call to return all the details of the SQL Server instance. The rest of the article will use this module, but you can of course create your own scripts that export the data you want. PowerShell is very good at exporting data to text files or XML. Exporting to text files is a good solution for small pieces of data for singular tasks. You can create multiple text files for various types of data but this can get disorganized. For example, if you export all the pieces of information mentioned in the section “What Needs Documenting?” than you would end up with 15 files. XML is very good for organizing data but it is harder to read than a simple text file. You would have to use another application to read the XML and output it in legible fomrat. Therefore, my preference is to export the data to an Excel sheet. Unfortunately PowerShell has no native feature to allow us to create Excel sheets and export data to them. We have the Export-csv cmdlet, but then we still have the manul task of importing all the CSV files into an Excel spreadsheet. We could also use PowerShell’s COM interface to export data to Excel, as described here. However, you’ll need Excel installed on the machine running the PowerShell script, and Excel should not be installed on a server, in my opinion. Therefore the option I use is the ExcelPSLib PowerShell module, which can be downloaded from here. Microsoft decided a while ago to start using the OpenXML data format for Office documents. This PowerShell module can create an Excel document; create separate sheets, save the data to the sheets. You can even setup formatting for your tables. And the best thing is it is fast and you don’t need Excel to be installed on the running host. The idea is to get an Excel document per SQL Server instance. The document contains multiple sheets, one sheet for every piece of information we want to retrieve; a sheet for the OS information, a separate sheet for the databases and so on. So let’s start to retrieve the information from the database servers. I’ll show the major element of a PowerShell script called Get-MachineInformationExcel.ps1, which uses the functions defined in PSSQLLib to retrieve the information, and uses ExcelPSLib to export it to a nicely formatted Excel spreadsheet. The idea is to automate the documentation of multiple SQL Server instances. To make this possible I’ll create a function that takes an argument for the server name, the instance name, and the destination to which to export the Excel file. The name of the default instance can be “MSSQLSERVER” or be left out. To make sure the server object is created in the same way for both situation the following code will check the name and declare the target variable. The next section of code specifies the details of the output Excel file. It will take the name of the server, the name of the instance and put a timestamp on the file. The timestamp is in the file is important to know when the file was created especially when you document your servers regularly. First, we need to set some variables, which we will use to indicate the row and tab position. These two values are used to place tables on the right row and to create new spreadsheets at the right position. Next, we create the actual Excel package and workbook. [OfficeOpenXml.ExcelPackage]$excel = New-OOXMLPackage -author "Sander Stad" -title "Machine Information $target"
The next section of code is copied from the CodePlex ExcelPSLib website to create the stylesheets used in the Excel workbook. $styleGreen = New-OOXMLStyleSheet -WorkBook $book -Name "GirlStyle" -Bold -ForeGroundColor Black -FillType Solid -BackGroundColor Green -borderStyle Thin -BorderColor Black -NFormat "#,##0.00"
$styleRed = New-OOXMLStyleSheet -WorkBook $book -Name "BoyStyle" -Bold -ForeGroundColor Black -FillType Solid -BackGroundColor Red -borderStyle Thin -BorderColor Black -NFormat "#,##0.00"
$styleNumber = New-OOXMLStyleSheet -WorkBook $book -Name "Float" -NFormat "#,##0.00"
Not all styles are used but you can use and adjust any to your needs. Vertical tables with headers on the left – used for singular type information like system information or information about the operating system. Horizontal tables with headers on top – used for information like listing the databases, users and logins. With the vertical tables I go through each row and setup the header and value at the same time. For these kind of tables I will first setup the header and after than create a loop to get all the values in the table. Because the script is over 850 lines long I will show only one example for each method (vertical and horizontal table). The script below will first create a new worksheet named “System Information”. $excel | Add-OOXMLWorksheet -WorkSheetName "System Information"
It will create that worksheet at the specified tab position. The code for adding another worksheet to the workbook is the same every time. The only thing to do is increase the number of the tab position and give in the name of the tab. For monitoring properties the script will print out that it is retrieving data. It will than set the local variable “$data” to null and it calls the appropriate function in PSSQLLIB to retrieve the information. To make sure that some information has been retrieved the script will check if the length of the first field is at least 1 character. If so we can do something with the data. The next part will be to fill up the first and second column with the header information and data from the servers. The script below will fill the first column with header, in this case “Server Name”. $excel | Add-OOXMLWorksheet -WorkSheetName "Database Privileges" #-AutofilterRange "A2:G2"
To retrieve the values for each row I use a foreach loop. Now that we have the information written to the workbook we have to do the final thing and that’s to write the data to a file. We’ve already made up the filename and path to write to. The file will be written to the designated path. Of course you don’t want to run this on just a single server; you want to document all of your servers and instances in one go! All of the code is in a function that takes three arguments. We can use this to execute this function for multiple machines. The code below will import the data from the CSV file and loop through each item and executing the function. $items = Import-Csv "C:\sqlserverinstances.csv" -Delimiter ";"
This will make it possible to get a complete overview of all the database servers within minutes. Now that we’ve discussed the basics you can consider expanding the solution to collect information about the backups, disk latencies, top running queries, errors from the log file and more. You could make a solution get an instant view of your system at that point to troubleshoot a performance issue or optimize a query. If the information is in SQL Server there is a way to retrieve that information using SMO. Let your imagination go wild to get a solution perfect for your situation. The source to the PowerShell code can be accessed from the link below. Sander Stad has over 15 years of IT experience in roles ranging from development through to support. He's been working with SQL Server since 2000, and also has experience developing in Java and C#. He is a huge PowerShell enthusiast and likes to use it to automate everything. Having started a new role with a SQL Server no one had any information on, this was extremely helpful. Is there anyway to remove objects from the list…? I do not need to see LastDifferentialBackupDate, and having it in the list is causing issues. Great stuff, thanks for publishing. If you want to remove some lines from the excel you can remove the lines from the code from the for loops. Than also remove the information from the header. I see it’s indeed a typo. Is shows that is doesn’t matter how many times you look at the code, you always have some code with typos. I’ve been able to reproduce this situation. I’ve seen this happen when I executed the script from the ISE. I assume you’re using the ISE to run the command because I haven’t been able to reproduce this in a PoSh command window. This problem has something to do with the runspace in the ISE. To solve the issue, open a runspace by going to "File" -> "New PowerShell Tab" or Ctrl + T.
#No Errors !! $server.logins filled from "VALIDSERVERValidInstance,1453"
When running scripts for remote server, received access denied for get-hostsysteminformation, get-hostoperatingsystem,..etc, while was able to get all sql server related information. For local server had no issues running scripts. First off, thanks for the great scripts. This doesn’t seem to be working for clustered named instances. And I would assume named instances with a port <> 1433 would also have a problem. When I dug into the issue, I found that when the Server SMO object is being created, it is passing as port number of 1433 as a default. As an example: $server = New-Object (‘Microsoft.SqlServer.Management.Smo.Server’) "sqlclusterv01clus1,1433". I don’t think he port should not be passed. When I removed $port from being passed, it worked…mostly. The next issue is that AvailibilityGroupName and TargetRecoveryTime are database properties that are not present in 2008 versions, so they would need to be handled as exceptions when null. An example input file for would also be a great touch. I got the code from the sql server posh virtual chapter onedrive. Nice article and thanks a lot for using ExcelPSLib ^^ It’s good to see people using it ! https://uploads.disquscdn.com/images/2c179a4ddc88e3c105511fb3a67d60d1c9bee6ae34ebf09bafa72e13ce2c8f20.jpg Thanks for sharing wonderful inventory code.I have removed default server port 1433 as it was throwing error. policy is also unrestricted for powershell ISE. Where i can change Path for outputfile:”H:Mijn” ?? to avoid just above error for output during calling of “WriteBytes”. using SQL Server auth with instance, user and pass ? One way of working with SQL Server in PowerShell is through the SQLServer PSDrive that’s created when the SQL PowerShell snap-in or module is imported. This allows you to work with SQL Server as if it were a file system. I personally don’t like the PSDrive that’s being created. Nowadays I would use dbatools for the majority of the work I do as a DBA. SQLPS: This module is included with the SQL Server installation (for backwards compatibility), but is no longer being updated. The most up-to-date PowerShell module is the SqlServer module. SqlServer: This module includes new cmdlets to support the latest SQL features. The module also contains updated versions of the cmdlets in SQLPS. In Windows 10, I try Import-Module -name SQLPS, I get error: not found assembly ‘Microsoft.SqlServer.ConnectionInfo, Version=13.0.0.0, Culture=neutral, PublicKeyToken=89845dcd8080cc91’. Maybe I have not latest versión SQLPS. Anyways, SQLPS is no longer being updated.